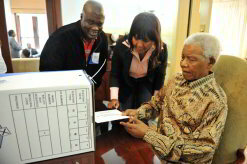 More than 23 million registered voters will have the opportunity on Wednesday, 18 May 2011, to elect their municipal councillors in South Africa’s fourth democratic municipal elections. Unlike in previous municipal elections, every voter in South Africa will be able to vote for one of 4 277 ward councillors to represent them in their municipality. The ward councillors can be either a member of a political party, or an independent. A further 458 councillors will be appointed though a proportional representation vote in each municipality. This excludes district council councillors. In terms of this vote, if a party receives 70% support, it will be allowed to appoint 70 percent of the proportional representation councillors in a municipality. Half the councillors in a municipality are ward councillors directly elected. The other half are proportional representation councillors appointed in terms of candidate lists prepared by political parties. Voters living in one of South Africa’s eight metropolitan councils will receive a yellow ballot paper to vote for a party, and a white ballot paper to vote for a ward councillor of their choice. In South Africa’s 226 non-metropolitan local councils, voters will also receive a third green ballot paper. This is to vote for a party, which will through its candidate list appoint a percentage of councillors who will represent them in 44 district councils that will be responsible for providing bulk services to their municipalities. Voting will take place at 20 868 voting stations throughout the country. Unlike in the previous national election in 2009, people can only vote at the station where they registered. An average of 1 200 voters is registered at each voting station. In densely populated urban areas however as many as 8 500 people are registered at a single station. A total of 121 political parties and a record number of 748 independent candidates will take part in this election. The high number of independent candidates is largely due to discontent with candidates proposed by the ruling African National Congress (ANC). For the first time ever, only two wards in South Africa will be unopposed. The ANC candidates will have no opponents in Komga and Queenstown. In Cape Town, which is currently controlled by the Democratic Alliance (DA), a record number of 32 parties will take part in the polls. A total of 53 596 candidates have been proposed by various political parties to contest this election. In 2006 the ANC received 64.8% of the vote, the DA 16%, the Inkatha Freedom Party 7.6% and a number of smaller parties the rest. Voting will start at 07h00 and booths will close at 19h00. Ballots will be counted at the voting stations. The results will then be communicated to the Independent Electoral Commission‘s centre in Pretoria. The first results in the elections are expected before midnight on Wednesday evening. Final results should be out by not later than Friday morning, 20 May. Because of changes to the Electoral Act, an Electoral Court will for the first time have the right to declare an election null and void as a result of objections, and order a new election in an area before May 31. The average turnout for municipal elections since 1994 has always been below 50%. In national elections by contrast more than 80% is not unusual. Analysts say more than 50% turnout would be exceptional and could result in changes in the country’s political landscape. After this election, Buffalo City or East London and Mangaung, in which Bloemfontein falls, will become metropolitan councils, bringing the total number of metropolitan councils in South Africa up to eight. This will cause the number of district councils to drop to 44. The number of non-metropolitan councils will be reduced to 226, from the previous 237. Follow BuaNews, the government’s news portal, on Facebook and Twitter to get the latest news on the 2011 municipal elections. Download the official list of voting stations (PDF, 640 KB). Download the official list of mobile voting stations (PDF, 666 KB).